Posted on April 23, 2019 at 5:05 pm. Reethi Faru Resort, a stunning lush tropical heaven with white sandy beaches, easily yielding to green shallow waters around the reef that merge with the infinite blue ocean. Located on the island of Filaidhoo in Raa Atoll, you can reach this island by a scenic 40-minute seaplane flight with a stunning aerial view of the Maldivian thousand isles or simply take a 20-minute domestic flight to Dharavandhoo followed by a 40-minute speed boat ride to the island. Reethi Faru Resort has a total of 145 villas and suites. The Villas and suites are built using recycled-solar brick made from recycled soil, bio consciously treated sustainable teak from Indonesia and lacquer work and ceramics from region. 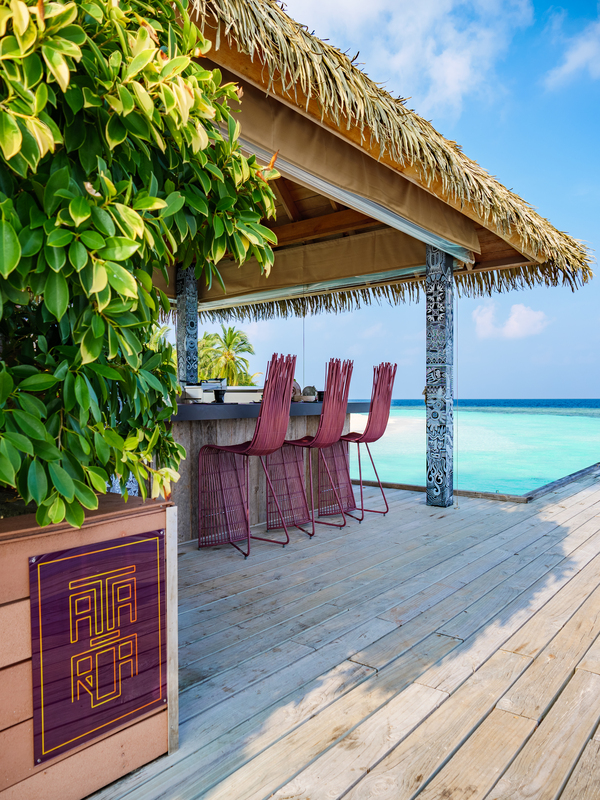 Experience the amazing wine & dining options at the Reethi Faru. A myriad gastronomic experiences spread throughout the island among six restaurants and six bars, offering delicious delicacies, savory aroma and excellent wines. Revitalize at the Reethi Faru’s Coconut Spa. Designed to provide you a tranquil ambience with comfortable interiors and rejuvenation at its finest. At the spa they emphasis on rebalancing through warm rituals that detoxify your whole body, and make sure you’ll remember the experience forever. The many activities at Reethi Faru Resort will keep your cravings for joy and relaxation satisfied throughout the stay. Activities range from diving, snorkeling and water paddling etc. You can also maintain your fitness regime at the ‘Country Club in Paradise’ which offers equipped gym and yoga facility. With a focus on sustainable luxury, the resort invites you to co-share its vision of being the guardian of the island. Enjoy the sun, sand and sea by experiencing the warm hospitality of Reethi Faru during your visit. Posted on April 17, 2019 at 5:07 pm. Sun Aqua iru veli is a unique, high-class resort in the Maldives. A tropical heaven and a place to have fun, in complete intimacy. Located just a 40 minutes’ seaplane ride away from Velana International Aiport. Sun Aqua Iru Veli is set within its own lagoon in South Nilandhe Atoll (also known as Dhaalu Atoll). The pure, uncluttered white sandy beach surrounded by softly sweeping palms and luxurious tropical floras, Sun Aqua Irus Veli is one of the most beautiful islands in the whole atoll. Sun Aqua Iru Veli’s beach and overwater suites offer a wide range of in-room amenities and everything you need at hand. While at the resort, you can pick from six well-appointed bars and restaurants around the property. Tease your taste buds with an array of fresh flavors and culinary flair- with delightful food inspired by traditional Maldivian and modern international dining. The property is also home to a world-class wine cellar. Activities and water sports range from table tennis, table games, Jet Skiing and Sailing etc. Explore the island’s house reef at ease by snorkeling straight from the beach and discover the underwater metropolis of tropical fish and amazing coral gardens. Relax, unwind and rejuvenate at Sun Aqua Iru Veli, where some of the world’s most exceptional natural beauty surrounds you. Experience the best Spa care from Iru Veli and see how it feels to be truly rested. Soak into the spectacularly decadent five-star experience of Iru Veli without a single care in the world. With its pristine beaches, stunning lagoon and un-spoilt natural splendor, this is the heaven on earth you’ve been searching for. Posted on January 7, 2019 at 1:30 pm. By a 45-minute ride by seaplane from velaana international airport you can reach dhigali Maldives. Your chance to pamper your self awaits. Take advantage of day beds within the natural greenery offering indigenous therapies and healing traditions to fully rejuvenate yourlsef. Posted on April 12, 2018 at 11:40 am. 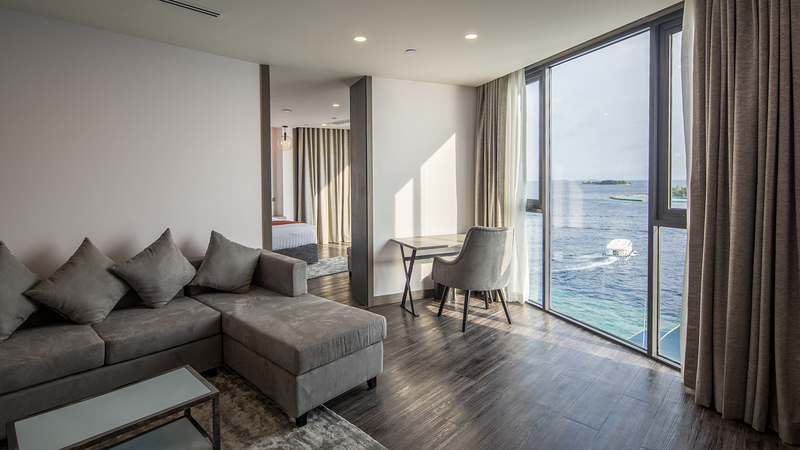 Situated in front of Hulhumalé ferry terminal and next to Hulhulé ferry terminal in Boduthakurufaanu Magu, Maagiri Hotel, had finally opened its doors to the public. The inauguration of the 9-storey USD 6 million (MVR 92.5 million) hotel, was held by Regent Maldives investors, on Saturday morning. The company’s top officials were Crown Company’s Director Ahmed Nazeer, Lily Hotel’s Director Ahmed Hafeez, Abdul Muhusin and former President Ibrahim Nasir’s wife Naseema Mohamed Kaleyfaanu. The four-star hotel, which had been built where Maldives’ first ever guest house was in the 1970s, room per night starts from USD 120 per night. Coming with latest facilities, 100 and 62 occupancy restaurants, café, conference hall, meeting room, fitness centre. The Executive Suite ensures the utmost luxury and comfort for its guests. 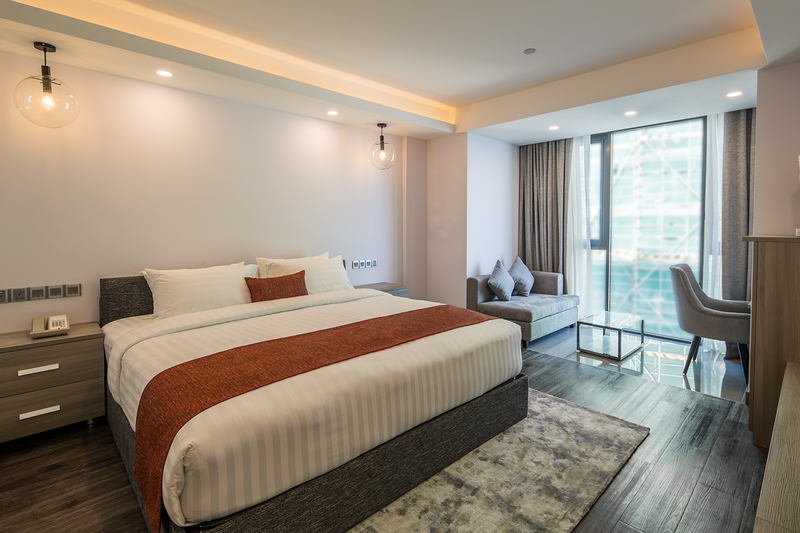 Designed to separate the bedroom and living area, guests can leave entertainment and work at the doorstep for an uninterrupted 8 hours of sleep. The Executive Suite offers plenty of space with room to spare. Indulge in its scenic views without leaving the suite’s premises. 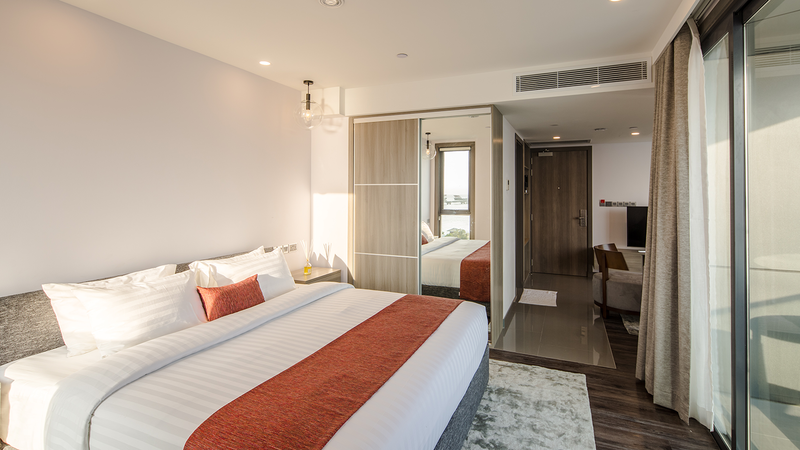 Located on the eastern wing of the building, Junior Suites add a breath of fresh air to your stay at Maagiri Hotel, with nothing but the ocean blues surrounding the suites. Catch up with your acquaintances and entertain your guests at the separate lounging area, whilst sipping on the various coffee flavours on offer. 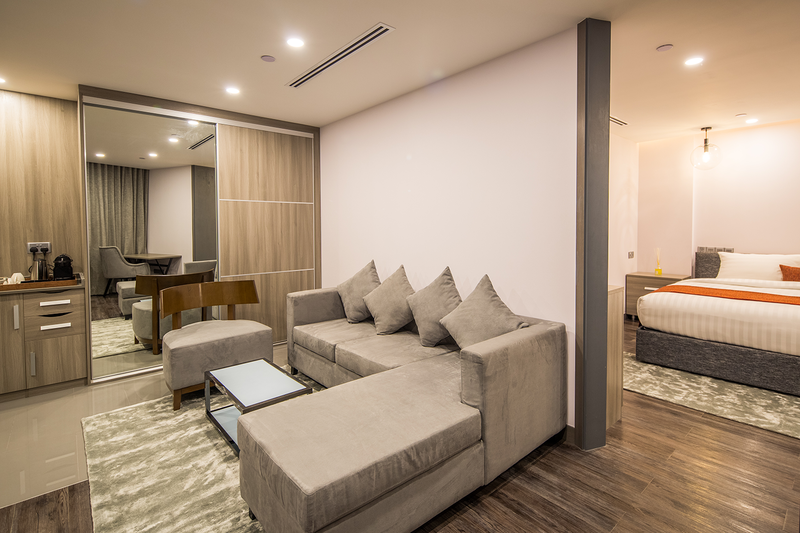 Isolate yourself in the calm surroundings the suite has to offer and look forward to every trip to Malé city. 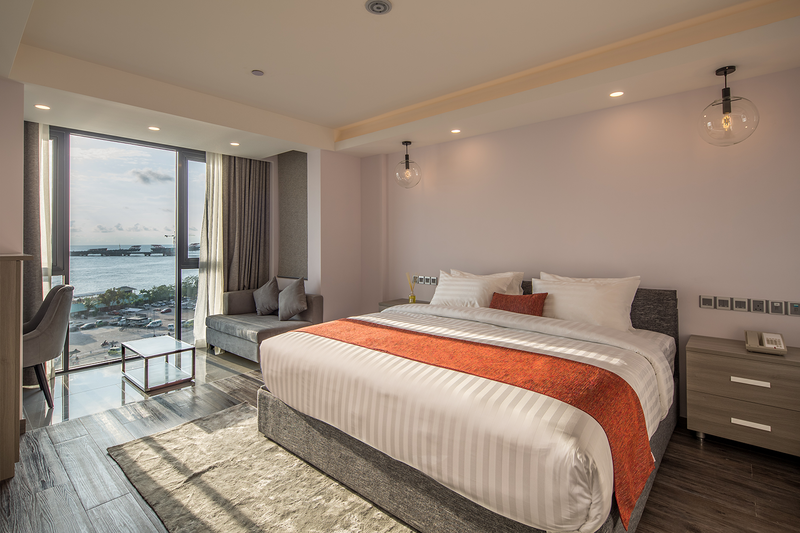 Catch a glimpse of one of the biggest infrastructural additions to the Maldives – Hulhulé- Malé bridge; right from your bedside. In this cosy yet, spacious room treat yourself to a variety of TV channels and detach yourself from the daily worries. 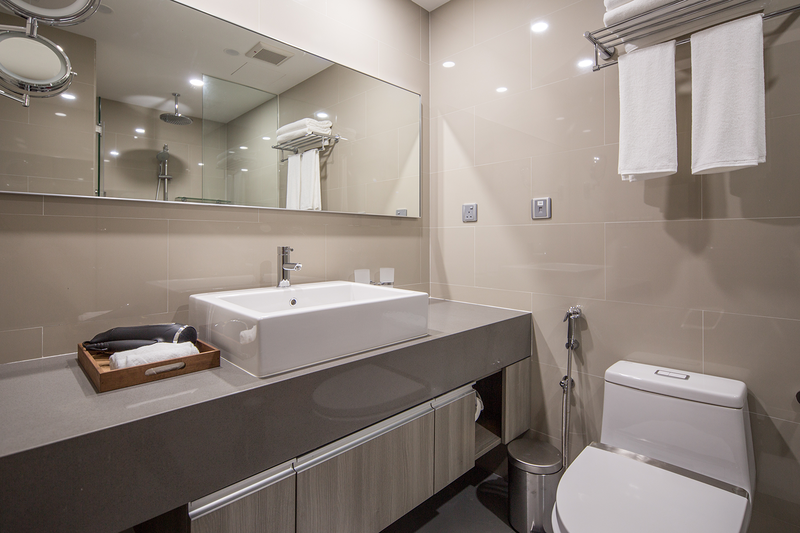 In the vicinity of the room, all your basic necessities are at your fingertips. If not, opt to call the reception to care for your customized needs. End your busy day in Maagiri Hotel and wake up feeling refreshed and energized to start the day. Immerse yourself in Malé city and enjoy what it truly means to be in this city, by taking in the view of busiest districts in the city. Find solace in these warmly lighted rooms and its light grey hues, while you take your mid-day break during your busy day in the city. 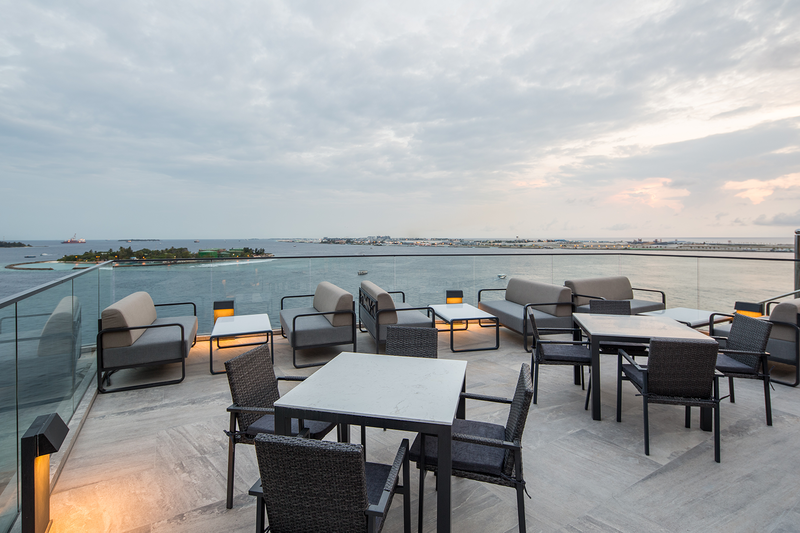 Located in a fantastic spot in the capital city Malé, from the terrace you can view beautiful sunrises, exciting scenes like flights landing at the airport island Hulhulé, and Malé – Hulhulé bridge. 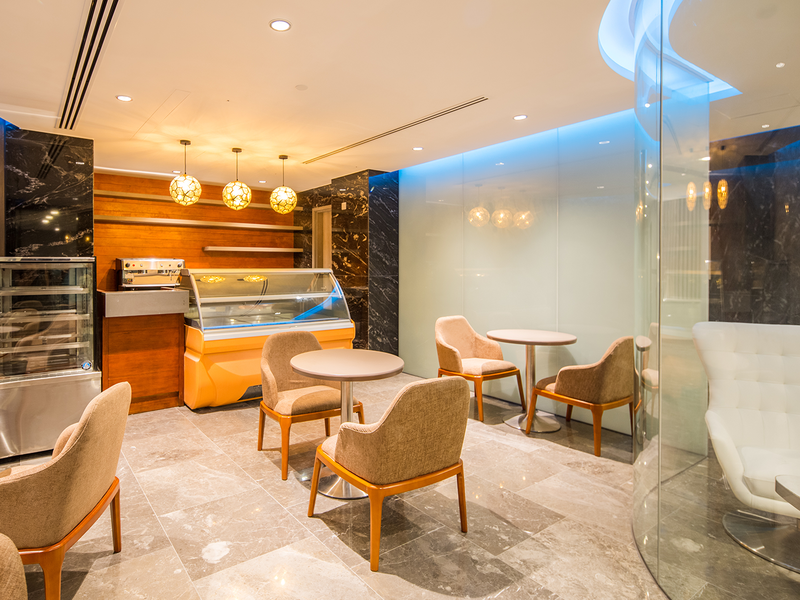 Coffee Curve with its jazzier vibes is the perfect place to grab that quick cup of coffee or have a quick mid-day snack. It provides a mix of refreshing juices and iced teas. A lighter menu of sandwiches, burgers, wraps, pastries and sugary confections are selected to give a boost of energy. Whether it’s an espresso or a café frappe, the service at Coffee Curve ensures the best of coffee. 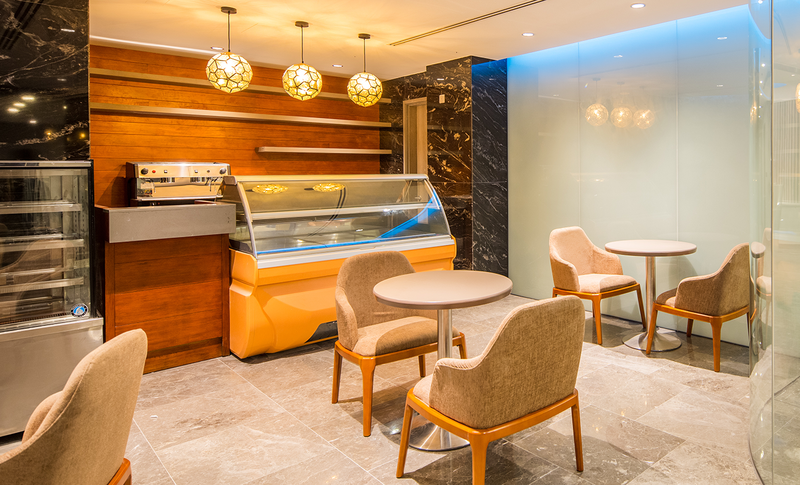 Offering choices of semi-fine dining with stylish buffets, express meals and a la carte dishes, Faru is a place to have your lunch and reconnect. A place to get away from the tropical heat with one of the delightfully fresh juices and chilled mojitos. 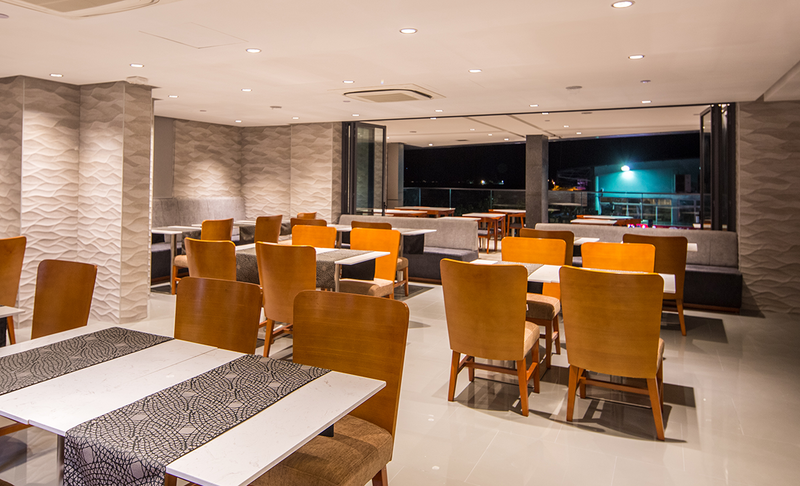 Faru is the perfect place for different occasions and gives you an ideal space for gatherings. With its refined décor and efficient service, Faru is the place for family dinners, corporate lunches and intimate wedding events. A fantastic terrace with panoramic views of the ocean, Peak with a lounge as well lends an air of exclusivity with unpretentious service. Prepared with passion and served in a stylish atmosphere with a warm service, the menu offers you tantalizing dishes. 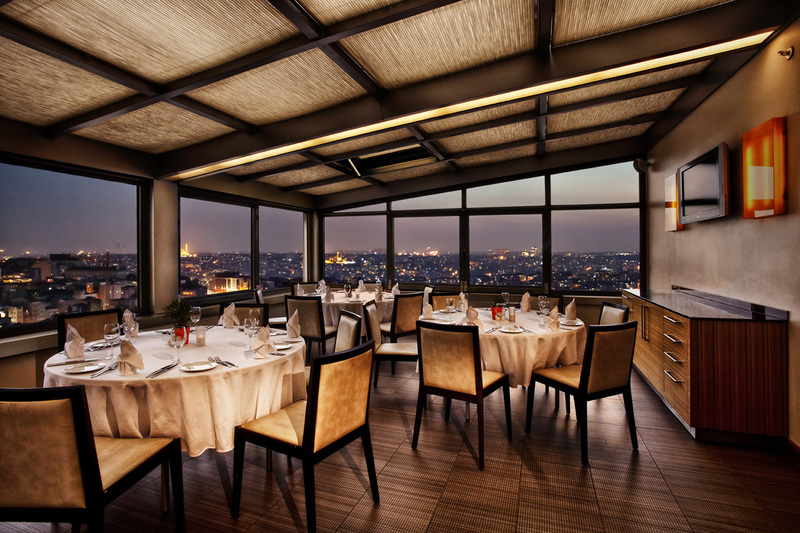 The peak is the place for your social lunch and it is an enamouring escape in the evening twilight. 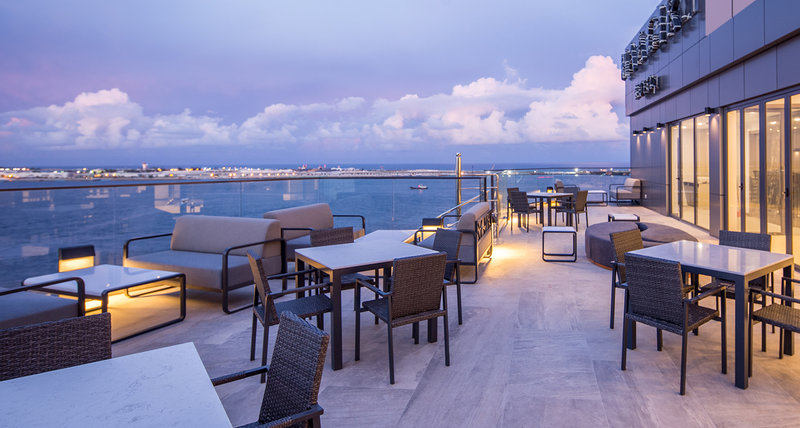 Clearly a spot for winding down with a masterly crafted mocktail, enjoying the hues of the sunset with a sharing platter or a gourmet burger. In the midst of the hustle and bustle of the city, Peak is a frequent spot for friends, families and associates. 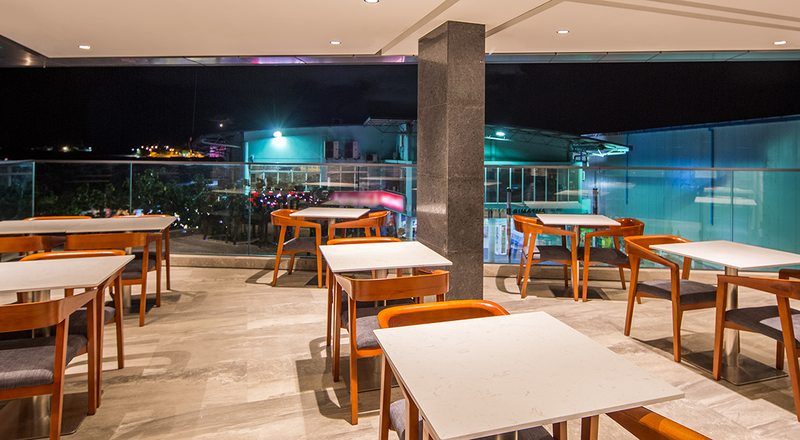 Overlooking the ocean, Maagiri Hotel offers you ideal spaces for your gatherings and celebrations. A special aspect, the hotel being on the street where the arrival jetties are located provides your guests easy access to the event. Whether it is an intimate wedding or a proud celebration, Maagiri Hotel provides its customers with a joyous occasion, complete with all amenities such an event needs with a warm ambience and efficient service. A fully-equipped gym with cardio machines and weights gives you that sense of routine. Lending you scenic views of the morning sky, the gym at Maagiri Hotel makes your morning sessions more amazing. Professional service and the well-kept gym at Maagiri Hotel ensures you stay fit away from home. Be it a corporate event or a business meeting, Maagiri Hotel is proud to host corporate guests for a perfect stay every time. With executive needs in mind, complete with high-speed internet, Maagiri Hotel provides the ideal space for important events and functions. 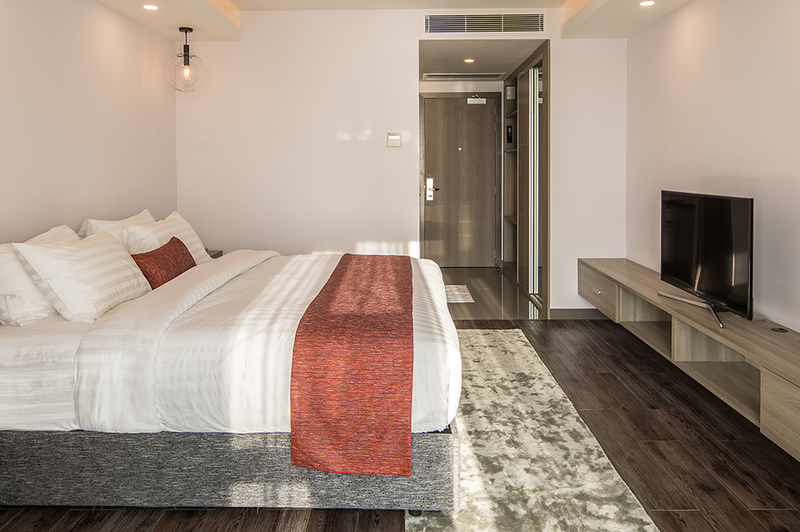 Whether Malé for a meeting or in between flights or looking to organize a lovely weekend with a mix of business and leisure, Maagiri hotel assures the best that Malé city can offer in hospitality. Posted on March 23, 2018 at 1:22 pm. Posted on January 24, 2018 at 3:28 pm. The Outrigger Konotta Maldives Resort has announced three new exciting developments for holidaymakers: a new mega value-added Family Getaway experience, an improved All-Inclusive (AI) offering, and a new All-Inclusive Plus (AI+) package. The Family Getaway Experience gives a family of four to six their own private 282 sqm two-bedroom luxury pool villa with complimentary transfers by flight and speedboat from Male to the Outrigger in the beautiful south of the Maldives. “Our Family Getaway and all-inclusive options really allow guests to switch off from their busy lives and rejuvenate surrounded by pristine natural beauty,” says John Allanson, the resort’s General Manager. Adults have multiple options such as spa treatments, group yoga, cooking classes, the art of barbecuing, scuba diving, paddle boarding, or jet skiing. Activities for the whole family include a myriad of wonderful options such as swimming across the equator, family picnic on a remote island, snorkelling trips, dolphin quest, semi-submarine excursions, learning about the stars, and a private family movie night. The enhanced All Inclusive package now includes breakfast, lunch and dinner at The Deck and Pool Bar as well as the main Blue Salt international restaurant. It includes a great selection of wines, beers, cocktails, teas and coffees from any outlet from 11 am daily. Many non-motorised activities are also included. For US$99++ per person per night, experience freedom with AI+ which gives all of the above benefits plus minibar refills, great discounts on private destination dining, reductions on spa treatments and full enjoyment of the chef’s premium dining experiences at The Deck, Blue Salt, Driftwood and Nala Rah (Japanese). Posted on January 10, 2018 at 7:05 am. Love romance? Get some extra in Kurumba Maldives on Valentine’s 2018, a day about romance and remembering the moments. Set on a tropical Maldivian island in the middle of Indian Ocean, the resort offers a range of experiences to explore hand in hand with your loved one. Special decorations in the main area to set the mood for your celebration and creative “love” cocktails in bars. A day at the spa, with unique Maldivian healing treatments, romantic outdoor couple massages next to the sparkling ocean or Valentine’s chocolate flavored specials, designed for the occasion. Treat yourself to an exclusive 5-course dinner served in Kurumba’s signature dining outlet – Thila restaurant. All courses are paired with fine wines selected by our sommelier. A true love and gastronomic journey in Kurumba Maldives to share between the two of you while wondering at the stars. Our Italian restaurant Isola will also have on offer an exceptional 3-course dinner menu carefully designed by our Executive Chef, especially for the occasion. Other holiday’s specials include romantic champagne and chocolate coated fruit delivery service from In Villa Dining, or dreamy Arabic night in Fez, Kurumba’s famous shisha lounge, with colourful after dinner cocktails and the fruity smoke from your shisha. Special accommodation deals for the period include the Romantic Gateway package offering a seamless escape to the resort with a few extras to enjoy, such as a Balinese massage at Veli Spa for a couple and relaxing Sunset Cruise in search of wild dolphins while viewing the sun setting over the Indian Ocean. Join us this Valentine’s Day to celebrate life and love through the true Maldivian island experience. Posted on December 19, 2017 at 10:43 am. Globally recognized as a world-class entertainment and lifestyle brand, Hard Rock International announces plans to expand its portfolio with Hard Rock Hotel Maldives and Hard Rock Cafe Maldives, slated to open October 1, 2018. As part of the Emboodhoo Lagoon project, the first integrated resort destination in the Maldives, the brand will work in collaboration with Singha Estate Public Company Limited, a leading Thailand-based development company, to provide travelers with the ultimate, family-friendly Maldivian experience. “This is the perfect complement to our integrated leisure and recreation experiences with Hard Rock Hotels and Hard Rock Cafes as part of The Emboodhoo Lagoon project,” says Thiti Thongbenjamas, chief investment officer Maldivesproject, Singha Estate Public Company Limited. With venues in 74 countries, including 179 cafes, 24 hotels and 11 casinos, Hard Rock International (HRI) is one of the most globally recognized companies. Beginning with an Eric Clapton guitar, Hard Rock owns the world’s greatest collection of music memorabilia, which is displayed at its locations around the globe. Hard Rock is also known for its collectible fashion and music-related merchandise, Hard Rock Live performance venues and an award-winning website. HRI owns the global trademark for all Hard Rock brands. The company owns, operates and franchises Cafes in iconic cities including London, New York, San Francisco, Sydney and Dubai. HRI also owns, licenses and/or manages hotel/casino properties worldwide. Destinations include the company’s two most successful Hotel and Casino properties in Tampa and Hollywood, FL., both owned and operated by HRI parent company The Seminole Tribe of Florida, as well as other exciting locations including Bali, Cancun, Ibiza, Las Vegas, and San Diego. Upcoming new Hard Rock Cafe locations include Managua, Cairo, Wroclaw and Chengdu. New Hard Rock hotel, casino or hotel-casino projects include Atlanta, Atlantic City, Berlin, Budapest, London, Los Cabos, Maldives, New York City, Ottawa, Dalian and Haikou in China. For more information on Hard Rock International, visit www.hardrock.com.